The Arturo Fuente Gran Reserva is the flagship line of this famous brand. Each leaf is selected from a private reserve set aside exclusively for the making of these cigars. These fine tobaccos are internationally recognized for their superiority, and are skillfully rolled with African Cameroon, Connecticut Shade or Ecuadorian Sun Grown wrappers. Taking absolutely no short cuts, every step of the cigar making process is done completely by hand, to ensure a finished cigar without parallel. 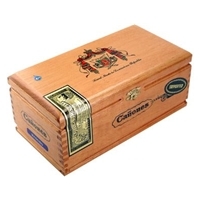 The cigars are then aged in Spanish cedar vaults to the peak of perfection to create a marriage of the blends producing an excellent “individualistic” heavyweight cigar to be counted among the world’s finest.